The first illustrated gift book about the top 50 world record game fish catches, written by the historian for the International Game Fish Association. The universal human interest in world records is nowhere more evident than in the world of sports. Every fisherman, from the seasoned professional to the most casual weekend angler, dreams of catching "the big one" and Big: The 50 Greatest World Record Catches delivers. 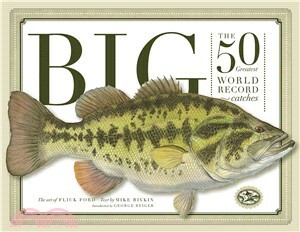 Artist Flick Ford and International Game Fish Association (IGFA) historian Mike Rivkin have combined talents to present the stories of the fifty most incredible record fish catches from around the world. The catches, selected for their sheer size, popularity, beauty, and exciting story, are presented in an oversize format, where the meticulously painted fish span double-page spreads. Amazing stories range from Dr. John Cook's legendary 1916 brook trout to fifteen-year-old Sara Hayward of Texas, whose wahoo catch was an astonishing thirty pounds bigger than the previous record-holder. World record catches are compelling, often for the normalcy of the setting—a day like any other, a fisherman on the last cast. This book salutes the sportsmanship of fishermen, the history of angling, and the fine art that keeps it alive.